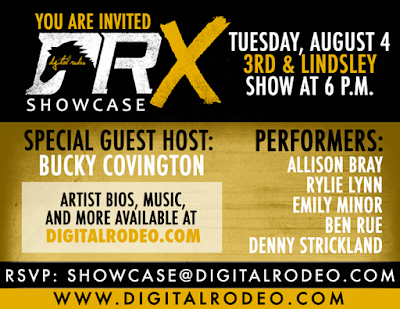 Online social network and country lifestyle portal, Digital Rodeo, has announced the artist line-up and guest host for the upcoming DRX Artist Showcase, to be held August 4 at 6:00 p.m. at Nashville’s 3rd and Lindsley Bar & Grill. DRX showcases offer valuable opportunities for attendees to enjoy musical performances from up-and-coming acts while engaging and networking with others in the field. 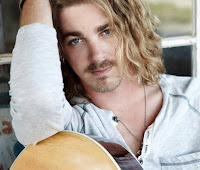 Bucky Covington: The rock-influenced Country singer first rose to fame in 2006 as a contestant on the televised talent hunt, “American Idol.” This past month, he released a new EP titled Happy Man, featuring his newest single, “I Feel Ya.” For more information on Bucky Covington, visit his website at www.buckycovington.com. Allison Bray: Allison is an accomplished vocalist at the young age of 18, who is driven by an incredible passion for music. Her ability to entertain audiences is remarkable and noted at home in Kentucky and the surrounding states. She auditioned for Season 7 of NBC’s “The Voice” in 2014. For more information on Allison Bray, visit her website at www.allisonbray.com. 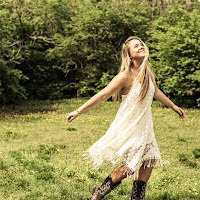 Rylie Lynn: Rylie Lynn's confident Country style, smooth voice and edgy lyrics show the true potential that she has in becoming one of Country music's "Leading Ladies." Her place on the 2014 Teen Nation Tour gave her original acclaim leading to various shows, and her most recent performance at the 2015 CMA Fest in Nashville, Tenn. For more information on Rylie Lynn, visit her website at www.rylielynn.com. Emily Minor: In 2007, Emily auditioned for “American Idol,” where she accelerated in the competition and became a Top 50 “Hollywood” contestant. She played more than 40 dates in 2014 and has over 50 dates scheduled in 2015. Most recently, Emily recorded a four-track EP alongside Scott Trayer. For more information on Emily Minor, visit her website at www.emilyminor.net. Ben Rue: Ben is a 26-year-old, born and raised in Silverton, Ore. He has worked on a family grass seed farm since he was 11 years old with his dad and two older brothers. Recently, he had the opportunity to be part of the first season of “X-Factor,” making it into the Top 80. He now lives in Nashville, Tenn. where he is continuing his dream of being a Country music singer. For more information on Ben Rue, visit his Facebook page. 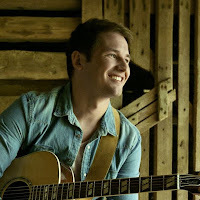 Denny Strickland: Denny recently released a new single in February of 2015 titled “Swerve On,” as well as an official video for the track. He has spent much of this year on the road for a radio tour where he has been promoting his new single at Country stations across America. For more information on Denny Strickland, visit his website at www.dennystrickland.com.